Lectionary (Lectionarium). Italy; Middle 12th Century. Latin Text; Revived Carolingian Script. A Lectionary contains selected readings from the Epistles and Gospels as well as the Acts of the Saints and the Lives of the Martyrs. These were read by the sub-deacon from a side pulpit. This practice necessitated that they be written in a separate volume, apart from the complete Missal. 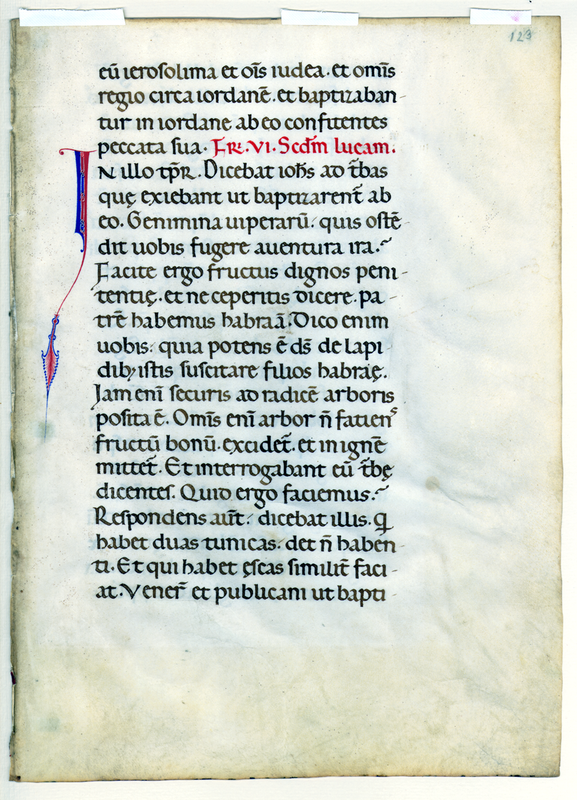 The fine large book hand shown here, suited to easier reading in a dark cathedral, is a revival of the script developed nearly four centuries earlier in scriptoria founded by Charlemagne. Maunde Thompson calls this Lombardic revival the finest of all European book hands. Even the 15th century humanistic scribes could not surpass it for beauty and legibility. The tone or hue of ink frequently helps allocate a manuscript to a particular district or century. Ink of brown tone is generally found in early manuscripts, less frequently after 1200 A.D.
Observations: The vellum is thin, supple, and barely yellowed. There is small evidence of the grain of the animal's fur, made more explicit by enlarging the image, and a few holes remain as evidence of binding. 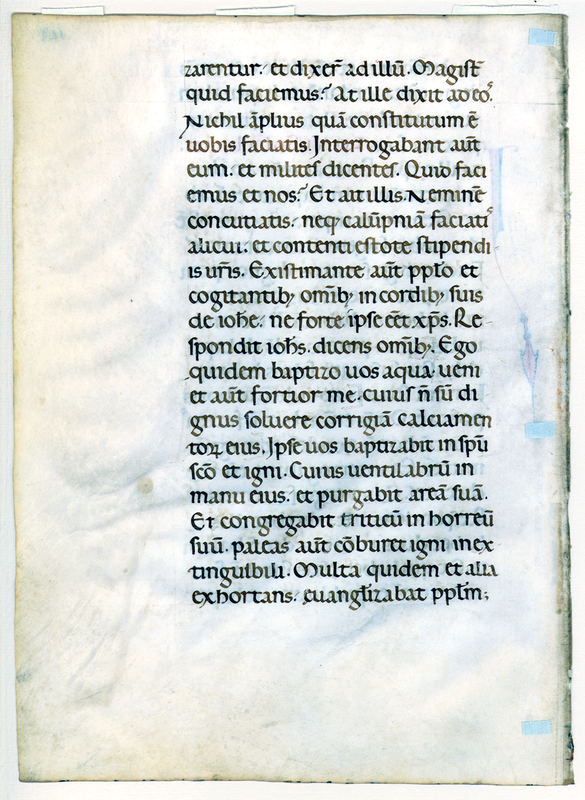 A spot in the left margin of the verso has bled through to the recto, and bleeding through of the text of the recto through to the verso is plain, particularly in the shadow of the large initial "I" which appears in the right margin of the verso side. The text is revived Carolingian minuscule, another example of which can be seen in Leaf 01. The ink is primarily dark brown with minimal fading; one phrase appears highlighted in red, and the initial "I" on line 5 recto is in red and blue. The number "123" appears in the top right corner of the recto. Text: Matthew 3:5-6 and Luke 3:7-12 (recto); Luke 3:12-18 (verso). Reconstruction Note! In Ege's original manuscript, this leaf followed what is now Leaf 03 in the Cleveland Public Library portfolio. eum Jerosólyma, et omnis Judǽa, et omnis régio circa Jordánem; et baptizabántur ab eo in Jordáne, confiténtes peccáta sua. Fr. vi. Sedum Lucam. 5 Then went out to him Jerusalem and all Judea, and all the country about Jordan: 6 And were baptized by him in the Jordan, confessing their sins. Fr. vi. According to Luke. -zaréntur, et dixérunt ad illum: Magíster, quid faciémus? At ille dixit ad eos: Nihil ámplius, quam quod constitútum est vobis, faciátis. Interrogábant autem eum et mílites, dicéntes: Quid faciémus et nos? Et ait illis: Néminem concutiátis, neque calúmniam faciátis: et conténti estóte stipéndiis vestris. Existimánte autem pópulo, et cogitántibus ómnibus in córdibus suis de Joánne, ne forte ipse esset Christus, respóndit Joánnes, dicens ómnibus: Ego quidem aqua baptízo vos: véniet autem fórtior me, cujus non sum dignus sólvere corrígiam calceamentórum ejus: ipse vos baptizábit in Spíritu Sancto et igni: cujus ventílabrum in manu ejus, et purgábit áream suam, et congregábit tríticum in hórreum suum, páleas autem combúret igni inextinguíbili. Multa quidem et ália exhórtans evangelizábat pópulo. ...to be baptized, and said to him: Master, what shall we do? 13 But he said to them: Do nothing more than that which is appointed you. 14 And the soldiers also asked him, saying: And what shall we do? And he said to them: Do violence to no man; neither calumniate any man; and be content with your pay. 15 And as the people were of opinion, and all were thinking in their hearts of John, that perhaps he might be the Christ; 16 John answered, saying unto all: I indeed baptize you with water; but there shall come one mightier that I, the latchet of whose shoes I am not worthy to loose: he shall baptize you with the Holy Ghost, and with fire: 17 Whose fan is in his hand, and he will purge his floor, and will gather the wheat into his barn; but the chaff he will burn with unquenchable fire. 18 And many other things exhorting, did he preach to the people.